I feel like planners are a topic I've addressed a few times before - but after posting a little bit about my teacher planner last week on Instagram and getting an OVERWHELMING response I thought it would be worth writing about how I'm currently staying organized in the classroom and at home. After 12 years of teaching I have FINALLY found a planner that works for me. Most teacher planners and lesson plan books I've looked into are designed for elementary school teachers and are split up into 15 minute time blocks and/or subject areas. I teach 6 sections of two different preps and needed space to do a brief note about what I was teaching in class that day, make notes about attendance, behavior, etc. and have room to make my to-do-lists for the day and when I stumbled upon this planner I knew exactly how to make it work. I split the left side into my two preps and then the right side into "to-do" and "kids". I like to keep track of the kids after-school activities as well as any special things about their day (i.e. dress up days, show-and-tell, etc. ) so that I get reminded the day before and don't forget. My actual lesson plans I have to input into our online system and those include more detail, academic goals, Biblical integration goals, assessment methods, etc. but this gives me a brief overview when I'm sending out make-up work, planning for upcoming weeks or trying to quickly refer back to previous weeks. My weekly pages are usually full of sticky notes and the to-do section is generally jam packed by the end of the week. I have way too much fun doing this and it's a total de-stresser for me :) I'm not an artist by any definition of the word but what I CAN do pretty well is recreate things I see on stickers, greeting cards, etc. My mom always had "how to draw" books around while we were growing up and from a really early age she had us blocking off pictures and recreating them to scale. I seriously love this planner so so so much and think that it would work in a lot of Mon-Fri work settings. And I use Papermate Flair pens in my planner because they're the BEST! So... now on to home/kid/weekend organization. I've used a Simplified Planner, a Day Designer, a Rifle Paper Co planner and while I really liked them they were way more than what I needed. At the beginning of the school year Dave and I tried out an app to keep our calendars synched but we both hated the electronic format. While it seemed like the "perfect fix" it just wasn't for us. As a family we really only needed the monthly pages and so I picked this planner up on Amazon and it is pretty bare bones but we LOVE IT! It lives on the little desk in our kitchen for easy access and so we can add to it when we're going through backpacks and folders and all of that. 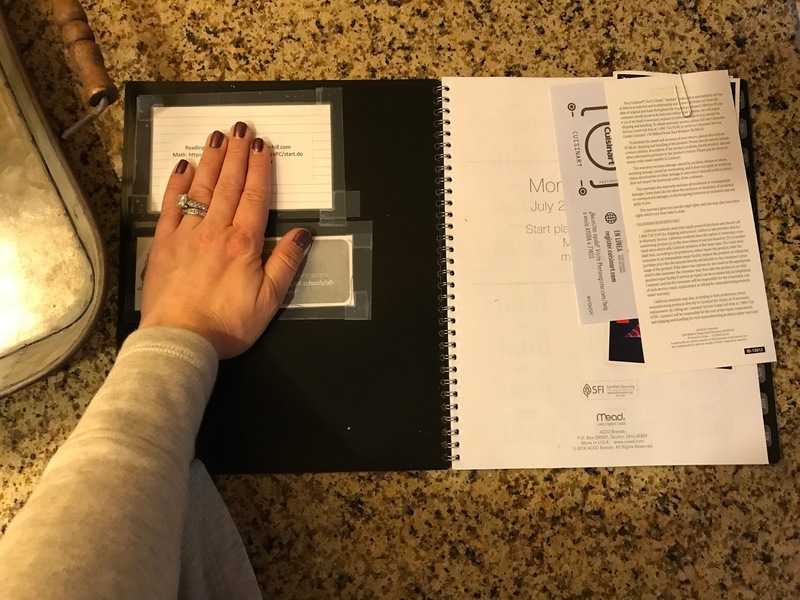 On the inside cover I taped the kids homework and online library logins and we paperclip invitations and other necessary little papers to the months that we've already used. It's NOT cute - but it works. There is no rhyme or reason to the colors and the little piece of paper has the boys spelling words, memory verses and other things we need quick access to during the week (I change this out weekly). 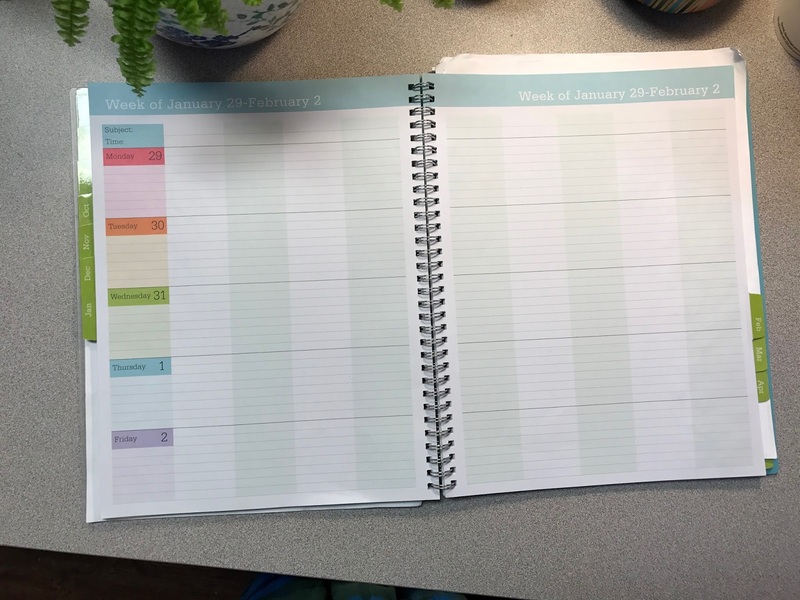 As much as I loved the daily space in the bigger planners - we just didn't need all that and this is so much simpler. I use the flair pens in this planner as well but it definitely bleeds through (these pages are much thinner than my school planner). It doesn't really bother me since this gets so messy anyway, but in the coming months I'll probably switch out to ball point pens. I hope that y'all found this helpful and I would LOVE to hear about and of your calendaring/planning tips and tricks! 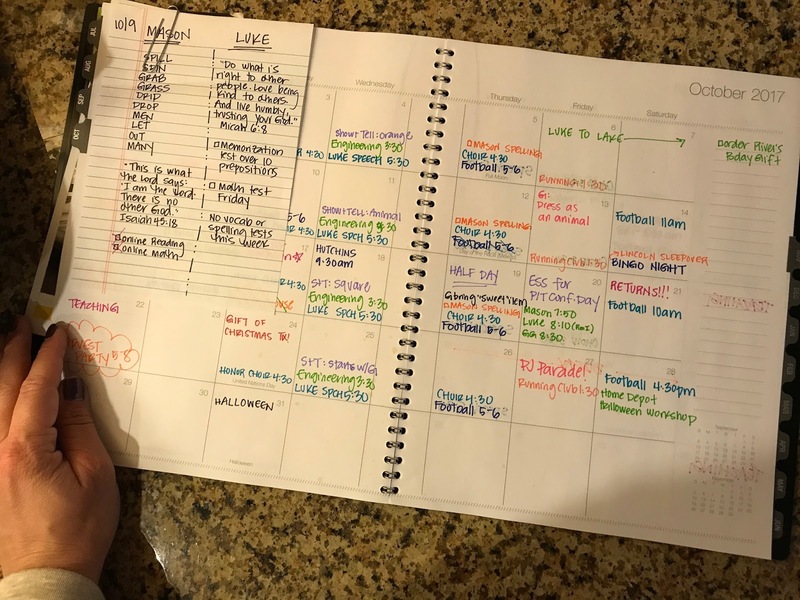 Keeping track of the three kids' schedules is NO JOKE and I can use all the advice I can get as I have a feeling it's only going to get worse as they get older! Happy Thursday, y'all!!! See you back here tomorrow for Friday Favorites! PS - This post contained a few affiliate links - thanks so much for reading and supporting my blog! I love all your teacher posts. 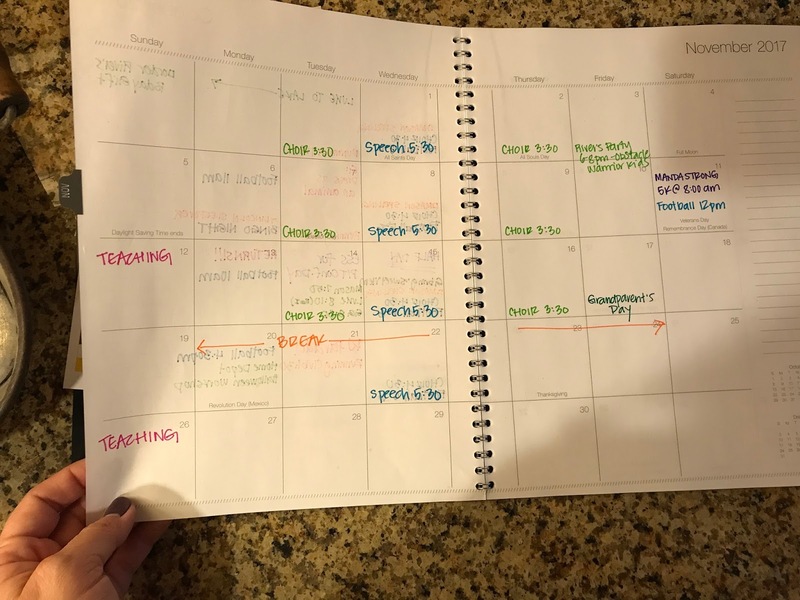 I teach high school and use a planner for my to do list and created my own planner for my lessons. Why do I love this so much??? I mean...I love, love, love this post SO MUCH! I also juggle two separate planners, one for home life and one for work life. But, my doodles are much more like what Erika describes above! Ha! I've used a dollar tree calendar like your family one for nearly 20 years... $1, shows me the month & was always thin enough to pack when the military moved us. 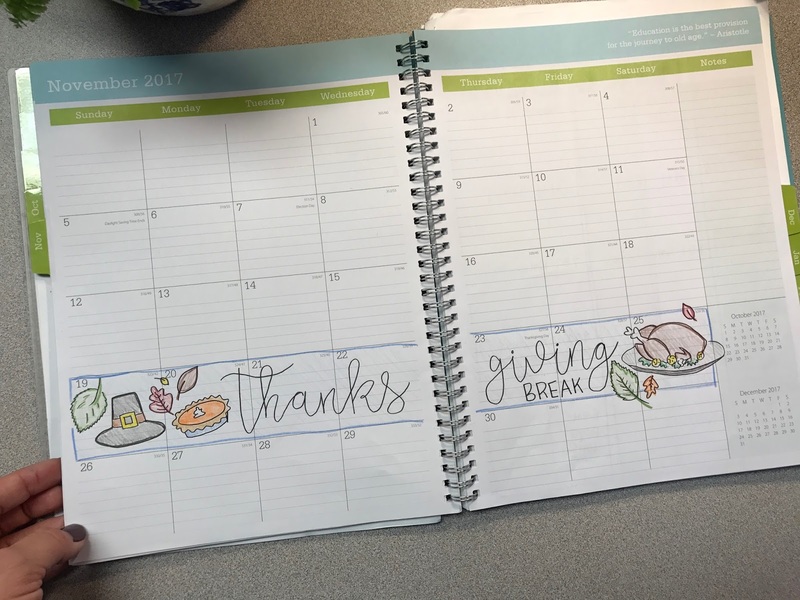 I love your planner! I wish I could draw/doodle like that!!! 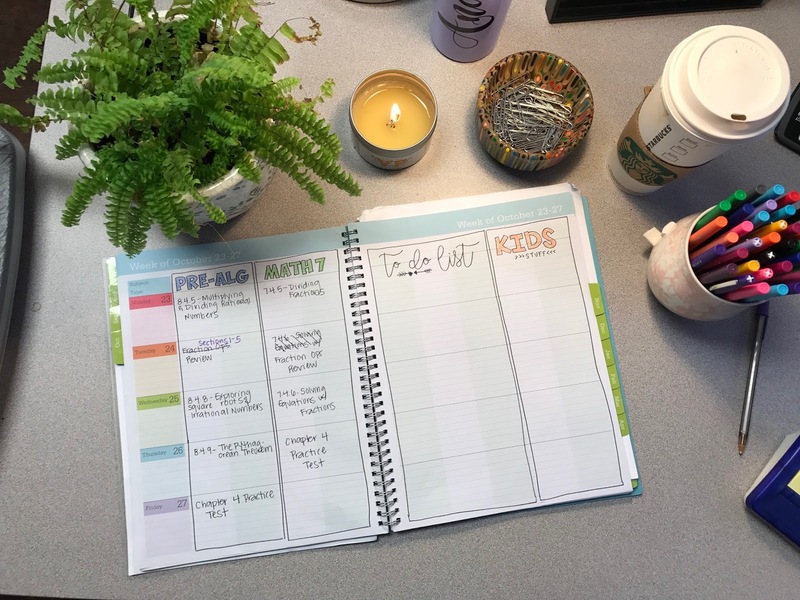 You should create your own planner and sell it! I'd rather pay you the 10-15$ than Target! I use the same exact planner but it doesn't look nearly as cute because I don't have your artistic ability! OMG this is the best idea in the entire world. Please, Andrea?!?!?!? Girl, I am jealous of your doodling skills ... I mean I was definitely not gifted in that area!! Stick people for life. HA! I love a good planner! Currently obsessed with my EC one. Andrea! Your doodles are gorgeous. 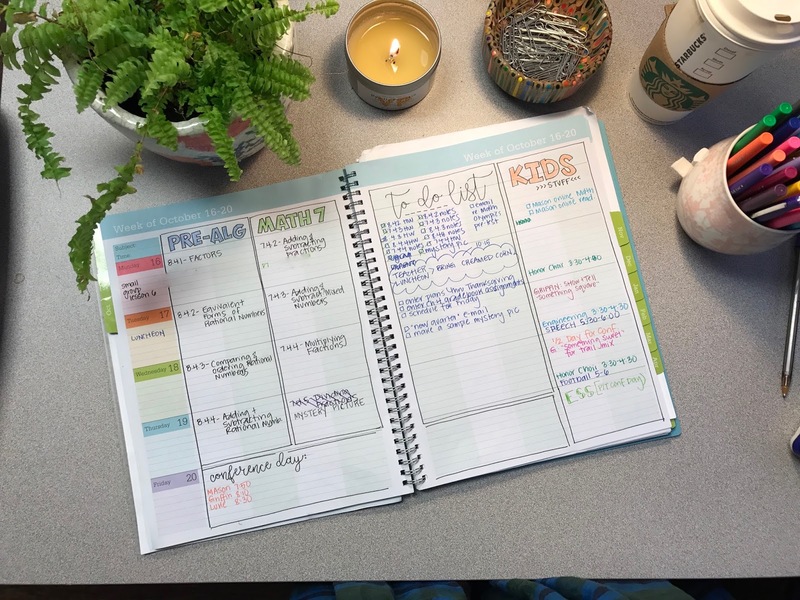 Your planner looks amazing! So silly question...what do you do with your planners at the end of it's year? Do you keep them? Do you throw them away? I have a weird thing about throwing away my planners from previous years. I guess it's kinda like a diary/blog for me since I don't document our life other than posting pictures to social media. I keep mine also. I love going back and seeing what I did. I LOVE this all! But especially your "doodles" which are works of art! 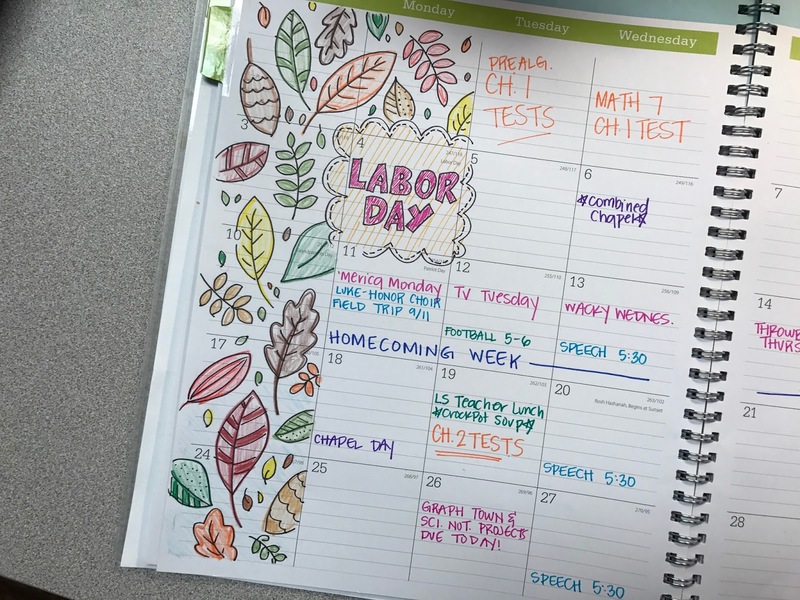 You should totally design a teacher planner with all of your seasonal artwork. 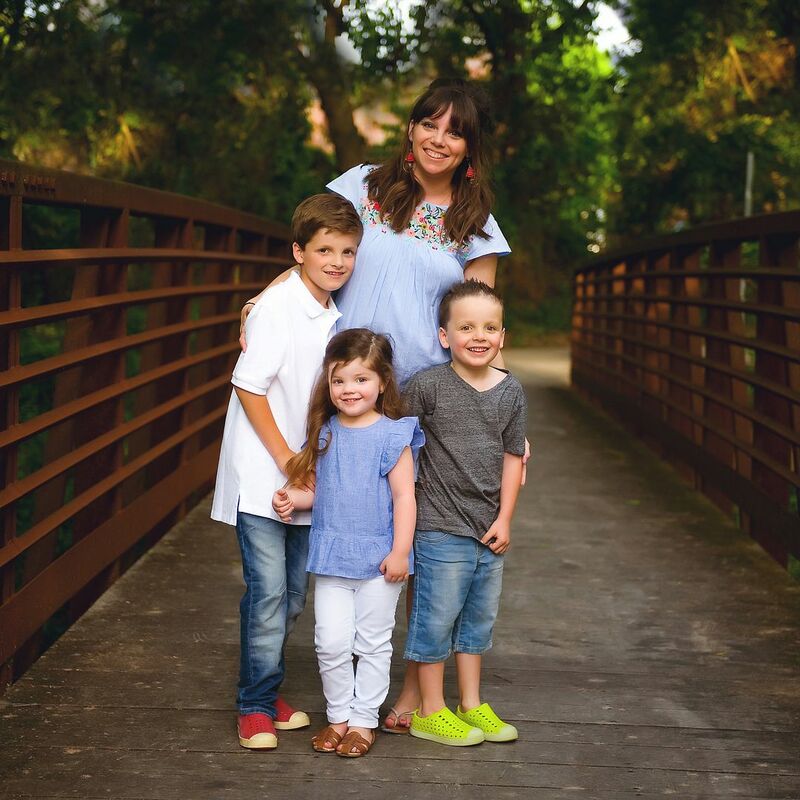 I'm a former elementary teacher, but now I'm home with my 4 kiddos. Because of the span of ages, they're in various schools throughout our district with much different schedules and homework needs. I also teach at our Church's religious ed program. You've given me so many ideas about keeping it all organized.Thank you for sharing!! I agree with another poster. You should definitely sell it with your drawings and then we could all color it in! I love the Blue Sky day designer. It's such a perfect planner and I HAVE to have a month at a glance. I can't do it any other way. I also only use pencil in my planners so I can erase things when plans change. :-) I had a friend I used to work with give me that tip when she saw me crossing things out in pen and the whole thing looked like a hot mess. I totally copied some of your doodles into cards for my friends! I'm obsessed with planners, and have yet to find THE perfect planner. I'm also obsessed with your doodles; I would give anything to even be able to doodle like you! Ohhhh I love your planner! I only use my Outlook Calendar- for both work and kid stuff- boring! I'd totally buy an Andrea McAnally planner! Love your doodles! I seriously love your planner! I don't like my handwriting, but then if I were to draw in my planner, it would look like a preschooler got a hold of it. Haha! Your handwriting and drawings are sooo pretty! I am not a mom but I am a middle school teacher. I'm a 3 ring binder gal. I have one paper that has my daily to do list that I made on a google doc. It's just 6 big boxes. The 6th box is for parent communication notes. I use a single paper I made on a google doc for my planner too. Both of those go in my 3 ring binder at the end of the week. During the week, they are binder clipped together. I put any papers I might need to complete my to do list behind to do list and planner with the binder clip. 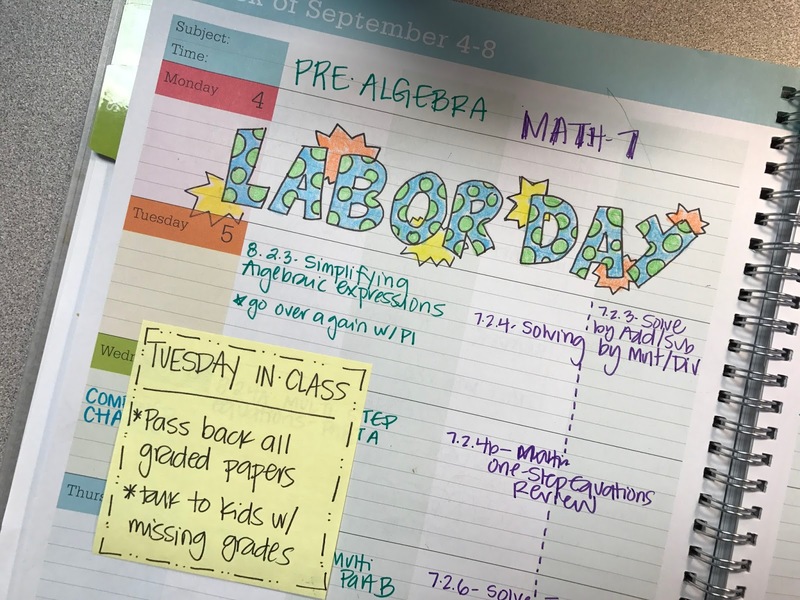 I use sticky notes on my to do list for connections I need to make with students. Those are the most important things I don't forget. I actually enjoy going to work when I have a list of things to accomplish during my planning period in the morning. Nothing feels better to me than knowing I get to cross off something on my list. Plus as soon as I wake up, I know what my goals are for the day. I need to do something like this at home! So behind on appointments! Andrea! Your doodles are amazing! 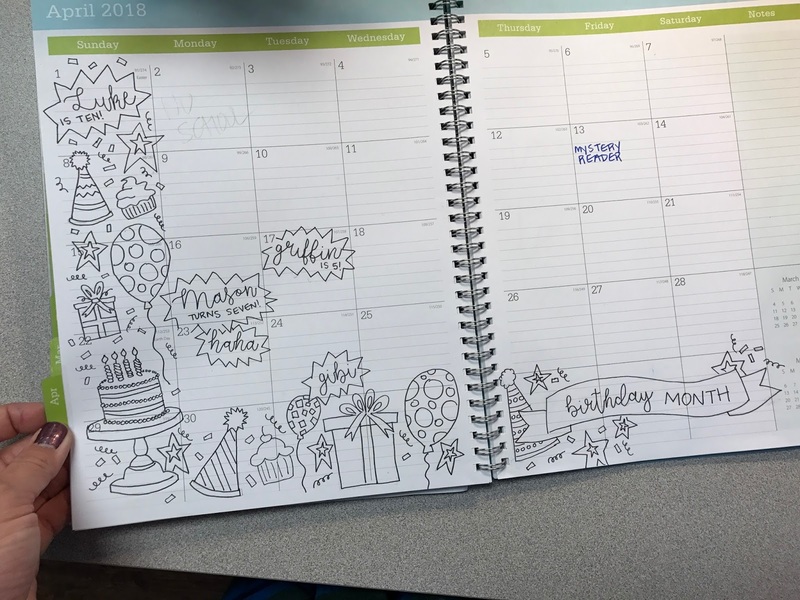 I LOVE planners and I love to doodle but wow, I need to step my doodle game up. You should totally create your own planner, I would so support that. I seriously think that you should design a planner with your art work in it! I would buy one! HA! You are very talented! Love your art work!